New Brighton Cohousing is an owner-occupied townhouse community, located at 6010-6034 Soquel Drive in Aptos, California, less than one mile from the beach. 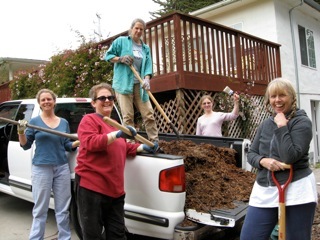 It was formed out of the umbrella organization Santa Cruz Cohousing and was established in the fall of 2007. Currently we are a community of 19 adult members, three children, four cats and three dogs. About half the community works or has worked in social services and the other half in education, the sciences, medicine, and planning. Our ages range from 2 to 81. We enjoy each other's company and share a common interest in living more sustainably. The property consists of 11 individually owned 2-story townhomes in 3 buildings, and one 1600-square-foot two-bedroom, two-bathroom house, all situated around a central courtyard. We use the house as our common house, with kitchen, indoor and outdoor dining areas, a children's room, and guest room. Community amenities include two group meals per week, a guest room, dining and meeting space, indoor and outdoor children's play areas, common garden and orchard. Our community is designed, owned, and managed by the residents. Membership requires participation in meal preparation once a month, active participation on a committee and an affinity group as well as participation in quarterly community-wide work parties. As much as possible, we do the maintenance and upkeep of the property ourselves.